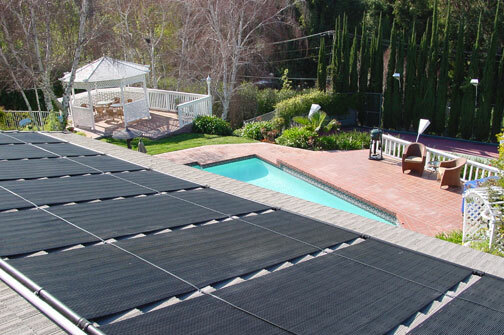 Using a solar heater for your swimming pool is a great way to reduce the cost of keeping your pool comfortable. A solar heater won’t cost more than a gas or heat pump heater to install, and relies on renewable energy. They also often last longer than gas or heat pump heaters. Solar hot water collectors are installed on your roof or wall facing the sun. Pool water is pumped into the thin pipes of the solar collector. Sensors and valves can be used to send water into the collector when the temperature is correct. The sun’s rays heat the water directly (unlike solar panels, which convert energy from the sun into electricity). Homeowners in very hot climates can also use solar collectors to cool down water at night, if necessary. For a visual see a solar energy diagram. If you live in a cold climate and plan to use your pool year-round, you’ll want to get a glazed collector system that’s designed to work well in cold weather. Otherwise, you’ll be able to use an unglazed collector, which will be less expensive. They work well as long as you don’t plan to use your pool when the temperature is below freezing. How should you choose a solar heater installer? Just like when you’re selecting an installer for solar panels, you’ll want to work with someone who has plenty of experience. Every installation will be a little different, depending on your local climate, the way the sun hits your property, and local building codes, among other factors. What is the cost of a solar heater system? Costs are typically between $3000-$4000, and have a payback period that can be as short as a couple of years.